With a view of passersby on Halsey Street providing a backdrop for visitors, Marcus B&P is positioning itself as the new destination for locals and visitors alike in downtown Newark. Located at 56 Halsey Street in the Hahne’s building, newly renovated by L+M Development Partners, Marcus B&P open its doors to the public for the first time on Friday, November 17th at 5 p.m.
As someone who prides himself on embracing the communities his ventures operate in, Samuelsson, at an appearance during a preview event before the opening, pointed out that 80 percent of the restaurant’s employees are from Newark. 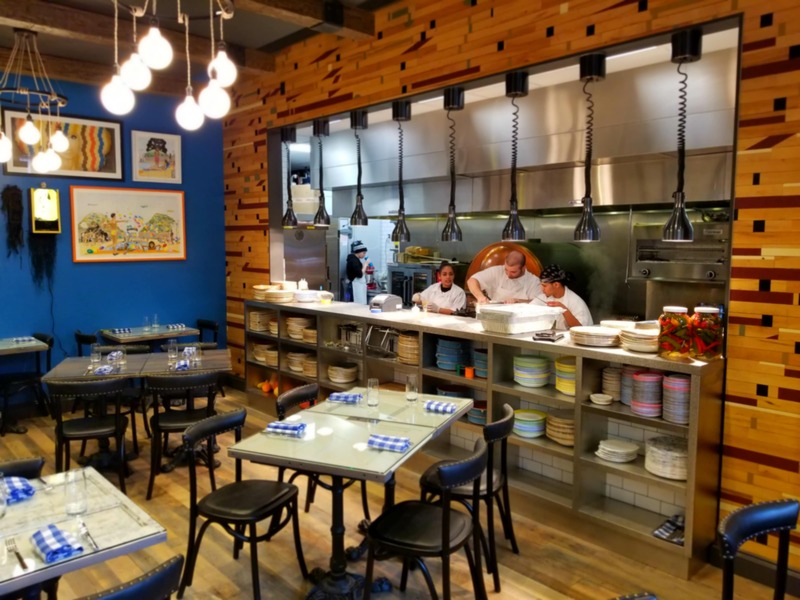 The interior for the full-service restaurant accommodates seating for 58 people, including nine at the indigo blue and copper-topped bar, and the rest at the glass-covered tables made from recycled doors. 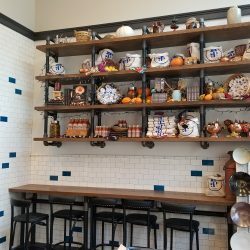 Here diners can enjoy shareable dishes in both small plates and a large format. Marcus B&P also plans additional seating for 20 people in the Hahne and Co. atrium. For the interior, designer Angela Bankhead and her team spent months carefully laying out and designing the space. They collaborated with local artists, including Jerry Gant, Colleen Gutwain and Kevin Darmaine, on the art pieces that adorn Marcus B&P’s walls. Marcus B&P also features the works of renowned Swedish photographer Pontus Hook, who also visited Harlem’s Red Rooster, which Samuelsson also owns, to capture its Sunday brunch patrons of Sunday Brunch. The restaurant uses additional reclaimed items for adornment, including gears from Hahne’s original elevators, which are used as decoration, and columns in the bar, which are also recycled from the original building. As with his other establishments, Marcus B&P will also embrace local ingredients and partner with local purveyors as much as possible. Some of the local provisions used in the kitchen include honey from Tassot Apiaries, hazelnuts from Rutger’s New Jersey Agricultural Experiment Station, Mazi Piri Piri Sauce (Portuguese hot sauce), local produce from Aero Farms and Toby’s Estate coffee. Many of these items are for sale to take home. For the cocktail program, Marcus B&P will offer signature cocktails with local names such as “Four Corners” “Ironbound” and “Halsey Hooch,” among others. The food menu has something for everyone including pizza, pasta, steak, fish and fried chicken. Signature Mediterranean-inspired items are the Nine Seven-3, Doro Wat Rigatoni, Amber Waves Flake Crudo and Festival Fried Chicken. Marcus B&P is open daily from 11 a.m. to 11 p.m.